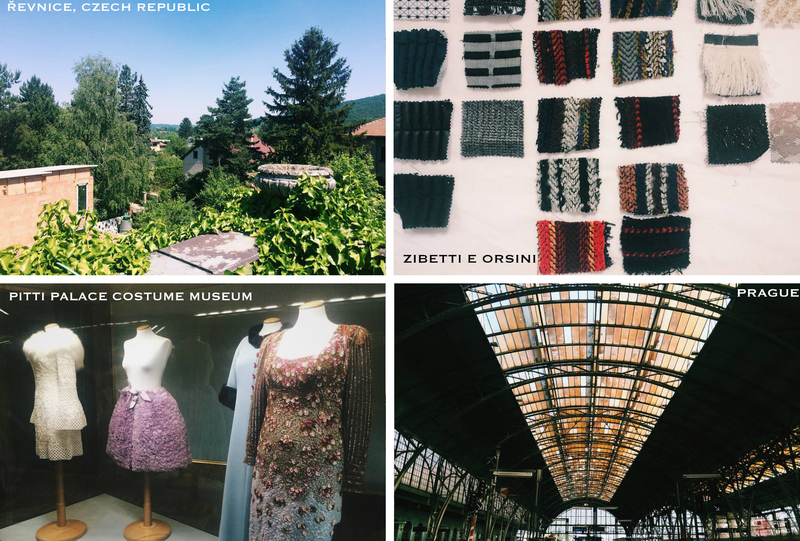 I recently got back from a trip to Europe, which included a summer session with the Fashion Institute of Technology that allowed me to cover seven different major cities in a timespan of only three weeks. 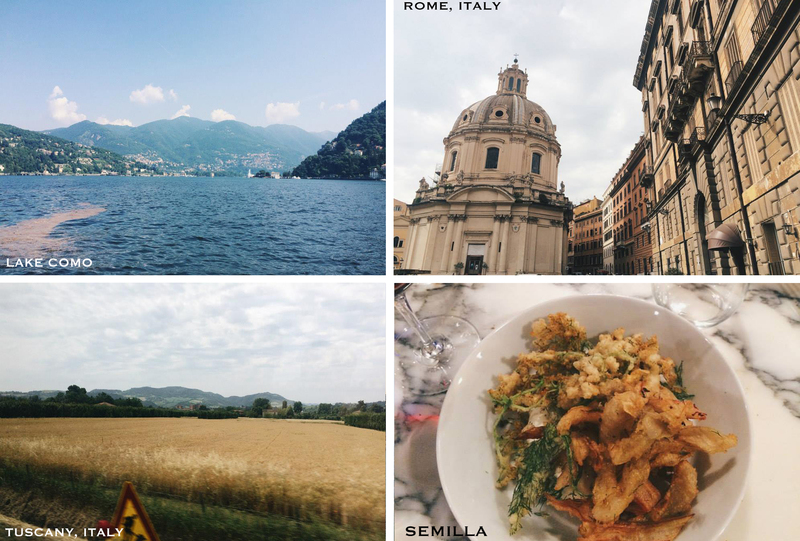 The trip was truly enlightening and allowed me to gain an insight to the culture of many different cities, along with the fashion and food scenes distinct to each. My trip was spent doing a lot of walking around different areas, eating and drinking at different places, and visiting a number of museums—many of which specialize in fashion exhibits. I started my trip off in Paris. After a very stressful travel experience of having my flight from Buffalo to NYC cancelled, being put on another flight that was delayed five hours, and then being forced to miss my flight from NYC to Paris, I arrived a day later than everyone else in the group. I was exhausted when I finally arrived in Paris, but I couldn’t let it stop me from enjoying everything I had planned on. My first day was spent getting some touristy things out of the way that I wanted to see again, like the lookout at the Sacré-Cœur in Montmartre. After some of these visits, I toured a perfume factory called Fragonard Parfumeur and then visited the Musée des Arts Décoratifs to see a great exhibition (Déboutonner La Mode) on the history of buttons in fashion and how the designs have changed over the years. Both the perfume factory and the button exhibit were very intriguing and taught me a lot about the history of both perfume and buttons in fashion. My next few days in Paris were spent relaxing and walking through the streets of Saint Germain and the gardens at Versailles as well as the gardens at Luxembourg and the Louvre. In the next few days I saw a presentation at a major fabric company in Paris called CLEC Linen Lab. The presentation was captivating and talked about how linen is actually the fabric of the future. They informed us that linen is more accessible and “green” than any other fiber that is commonly used now. I also was able to see the Jean Paul Gaultier exhibit at the Grand Palais museum. This was definitely one of my favorite exhibits that I was lucky to see in Paris. The exhibit covered three full floors of his designs—all on mannequins that had faces that were too realistic projected on to their heads. The designs were truly amazing to see up close and in person. 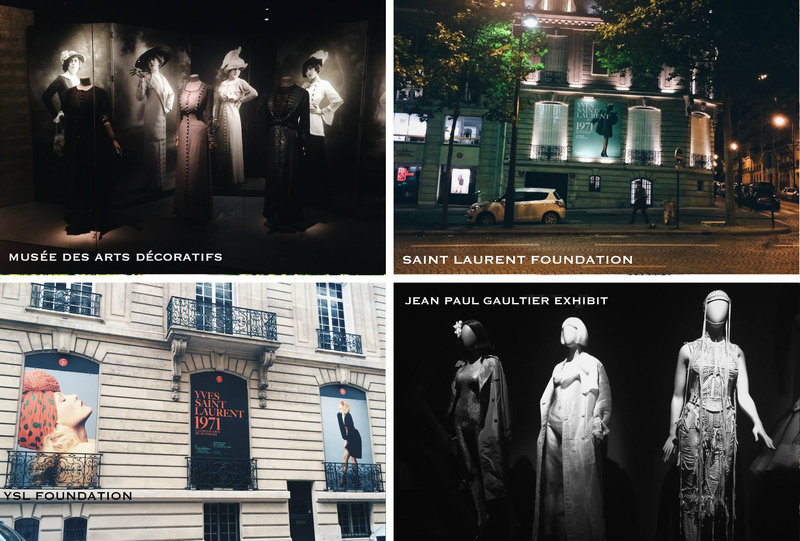 One of the other great exhibits I saw was the Saint Laurent exhibit at the Yves Saint Laurent/Pierre Berg Foundation. The foundation was amazing and was definitely worth the visit. It started out with a small exhibit of some of his designs and sketches, and ultimately led to his actual work space—complete with three original outfits that he had designed. It was also interesting to see prints given to Saint Laurent from Andy Warhol hanging above his desk. After this, I made my way to the Trend Union/Studio Eldekoort Forecast Service. If you follow any of my posts, you know that I am a textile designer and experiment a lot with dyeing techniques and processes. Therefore, it was amusing to see that the boutique in the trend forecasting company was showcasing and selling all garments that were hand dyed. The boutique/exhibit was very interesting to look at and I was extremely tempted to buy one of the pieces. The longer I stayed in Paris, the more I got acquainted with the culture and how the people who live there actually eat and drink. My boyfriend Jake, who was also in Paris, and I noticed that everyone in Paris frequently enjoyed the liquor Campari, so we decided to give it a try. It is now one of our favorite liquors: bitter, sweet, and flavorful all at the same time. Over the next few days, I saw the Jean Lavin exhibit at the Palais Galleria Museum which showcased some of her work from the early 1920s. After the exhibit, I got some shopping done in Montmartre. I stopped at two different stores that I bought pieces at. The first was a quaint boutique, Kika, that I purchased a great summer dress at. Then I bought a heavy, high-waisted plaid skirt and a pair of two-toned Chelsea boots with a slight heel at a vintage consignment shop called Chine Machine only a few blocks away. Chine Machine was the perfect place to stop and featured vintage consignment on two large floors of the building. They also had a great men’s section that Jake was able to find a few things in—and it should be noted that every item we bought was extremely reasonably priced. I had one of my favorite meals of the trip at a restaurant located in Saint Germain called “Semilla.” Everything that Jake and I ordered was incredible. I got two small plates – one a seasoned plate of Shittake mushrooms and the other a plate of vegetable tempura with a Greek yogurt sauce. Everything at Semilla, including the wine, surpassed our expectations and we both wish we could go back sometime soon. While in Paris, I also got to visit the famous embroidery company Ecole Lesage. Many famous designers such as Yves Saint Laurant worked with Lesage to embroider their garments. We were able to get a tour of the work space at Lesage and see all of the designers working on amazing embroideries that will eventually be used on designer name garments and accessories. The embroidery process was extremely interesting to watch and is definitely something I would like to learn how to do more in depthly in the future. Luckily for me, after the tour we got to go back to their company headquarters and sit through our own embroidery class at the company, taught by an employee designer at Lesage. The class was highly informative and enjoyable. 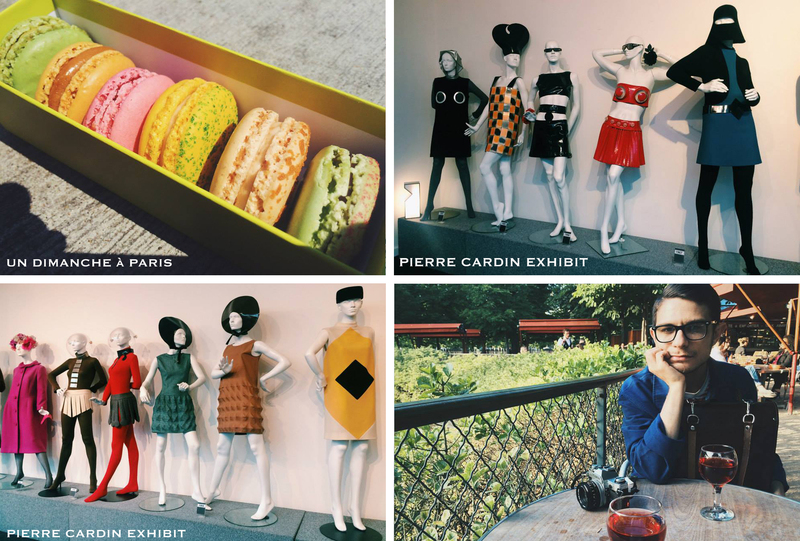 The next day in Paris I visited the Pierre Cardin museum. This was definitely another one of my favorite museums I was able to visit while in Paris. The museum consisted of three large floors all consisting of a very large amount of Pierre Cardin’s outfits on mannequins, as well as some of his furniture on display. The museum was very interesting and had a very futuristic feel to it. The Pierre Cardin boutique was also right next to the museum where you can actually purchase clothing from the Pierre Cardin line. On this day I also visited the Foundation Henri Cartier-Bresson which was a great, but smaller exhibit, and the Montparnasse cemetery. I also stopped at Un Dimanche à Paris, one of my favorite macaron/dessert shops in the city that I stumbled upon on my first trip to Paris about four years ago. After over a week in Paris, I spent a weekend in Prague before heading to Milan on Monday morning. My visit to Prague was fast, but very event filled and busy as I was trying to fit as much in as I could in only two days. Jake and I stayed at an amazing AirBnb right outside of Prague, in a beautiful suburb called Řevnice. The town was gorgeous, as well as our AirBnb home that featured a terrace from the bedroom where you could walk out to amazing views of the mountains and nature on the outskirts of Prague. Prague was only a very convenient 25 minute train ride away and the train station was only a 5 minute walk from our AirBnb. In addition to walking around all day and trying to see as much of Prague as we could in our short time there, we really enjoyed the Museum of the City of Prague that had a great exhibit containing photographs of Prague in the 60s. This was definitely one of my favorite non-fashion related art exhibits in Europe. After my busy weekend in Prague, I headed to Milan next. My visit to Milan was also very short, but while in Milan I got to see the Armani/Silos museum and the World’s Fair. The Armani museum was interesting and large and I enjoyed it more than I thought I would. The World’s Fair was also a great experience to be able to attend, and although I did not eat at it, I got to walk through a majority of the countries and even enjoy a shot of vodka in “Poland”. While in Milan I also got to visit the Belvest factory, located right outside of the city, which produces and assembles garments for big brand names such as Prada. It was definitely interesting to see how much work and effort goes in to creating each piece of clothing or accessory. I didn’t have a ton of time in Milan due to the fact that on two of my days in Milan I took day trips: one to Venice and one to Como. I didn’t have a ton of time in Venice or Como either, so a majority of my time at both places was simply spent walking around and trying to see as much of the city as I possibly could in only 5-6 hours. Both cities were gorgeous, however, and led to highly enjoyable days. On my last day in Milan I got to visit another embroidery company just outside of Milan: Zibetti e Orsini. We got to see some of the swatches of fabrics for the upcoming fashion season and also got to see how they design lace fabrics, using a computer program very similar to NedGraphics (the program I use to design woven prints, as well as regular prints). After this, I headed to the MaGa museum to see what I think might have been my favorite exhibit of all in Europe – the Missoni exhibit. The exhibit’s concept was to connect visual art to fashion, which I thought was a very intriguing concept and one that some people do not fully grasp normally. 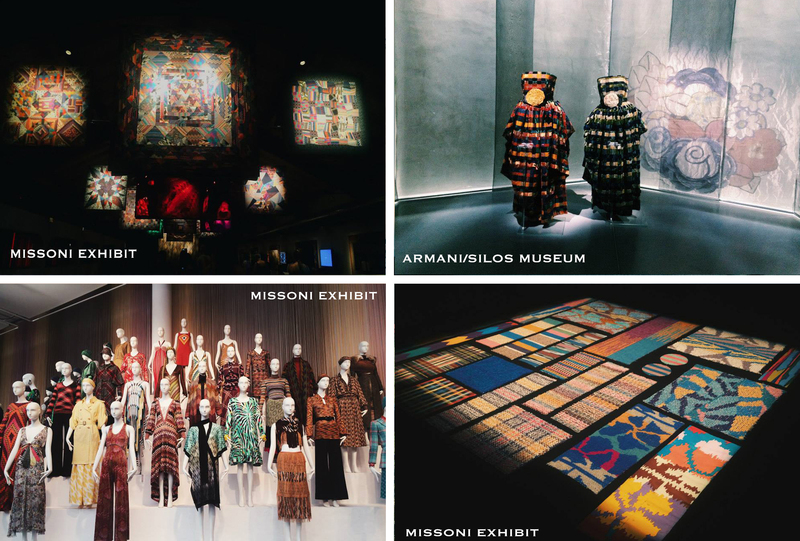 Therefore, the first part of the exhibit showcased visual art – a lot of abstract and pop art – that influenced Missoni’s designs. After the visual art you got to see Missoni’s textile designs – some woven samples, some knit samples, and some drawings/sketches. The samples were amazing and you truly got to see the artist’s inspiration from the visual art we had just viewed. After the textile samples, you were taken to see how the samples and sketches were finally executed by showcasing his outfits on mannequins, and then his rugs and tapestries. The outfits were extremely impressive, especially the textile design of all of the garments. There were a very large number of outfits displayed and even his men’s sweaters were hung on the wall. The rugs and tapestry work were even more impressive. Maybe I enjoyed this exhibit most because it correlated to textile design most, but the designs were truly inspiring. That night, after the MaGa museum, I met one of my father’s friends, who has lived in Milan her whole life, for dinner. She took me to one of the best restaurants I’ve ever been to, Ristorante Alice, located in the Eataly building in the Garibaldi section of Milan. The meal was incredible and consisted of a complimentary large bread plate and small appetizers, an appetizer, entree, and dessert of your selection, and even a little complimentary pastry platter. Everything we ate was amazing. You should note that the plates are all very small and it is quite expensive, but the complimentary platters and the quality of the food definitely make up for it. The Garibaldi section of Milan was also a trendy part of Milan that is definitely worth visiting. The next morning, I headed to Florence. While in Florence, I visited the Mercado Centrale, located in the middle of all the leather markets. The Mercado Centrale was an amazing visit for anyone interested in food. It was quite similar in looks and style to the Findlay Market in Cincinnati, but this was two full floors of vendors as opposed to one. The first floor was filled with different vendors selling variations of pasta, oils, wines, produce, and more, while the second floor was more dedicated to many different small places to actually sit down and eat. Everything on the bottom half of the market looked amazing and I settled on getting pasta, truffle oil, and a package of pasta spices to bring home with me. I wish I could have gone back for dinner at one of the restaurants on the second floor at some point but didn’t have enough time. I recently made the pasta at home using the truffle oil and spices I bought at the Mercado Centrale, and it turned out incredibly. We also stopped at many different gelaterias while in Florence – Gelateria Edoardo was one of our favorites. While in Florence, I also got to stop at the Ferragamo and Gucci museums. Both museums were fascinating; however the Ferragamo museum featured more about the history of the building than the actual shoes. The Gucci museum was actually very interesting to walk through and be able to see the variation of different products displayed. While in Florence, I also stopped at two great vintage consignment shops, one called Melrose Vintage close to the central area near the Duomo, and one called Ceri Vintage farther out across the river. I had a blast at both consignment shops and am so happy to have just stumbled upon them. At Melrose I purchased a great vintage dress that features a green top half and a rectangular black leather hand bag. At Ceri Vintage I purchased an amazing light blue, leather, two piece consisting of a sleeveless crop top and a tight, high-waisted skirt. Both vintage consignment shops had an amazing stock of clothing and accessories and were both fairly priced as well. While in Florence, I also got to visit the Pitti Palace which was absolutely fantastic. The Pitti Palace contains four large galleries to look through, as well as gardens that overlook the entire city. One of the highlights of the galleries was the costume gallery that featured clothing from hundreds of years ago. 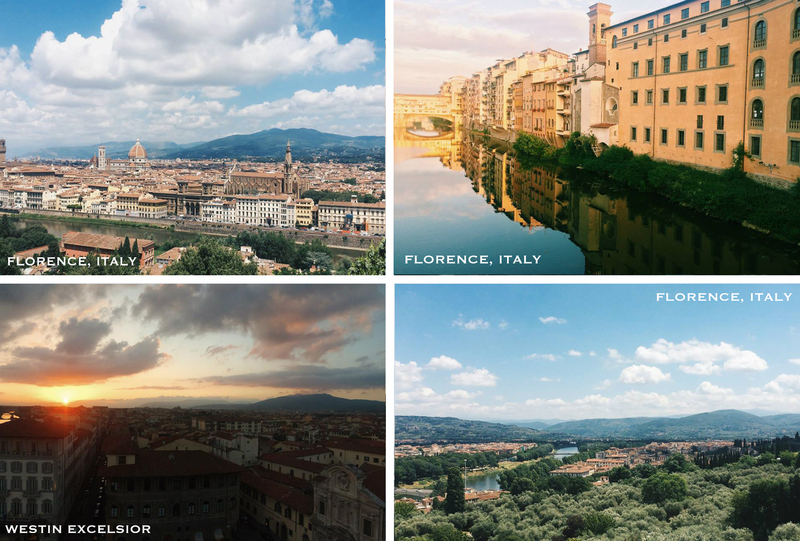 Other places I got to visit while in Florence were the breathtaking look out of the city at the top of the Fort Belvedere, the Academia Gallery where Michelangelo’s David exists, and finally the roof top of the Westin Excelsior that serves delicious cocktails and endless appetizers for only 18 euros with an incredible view of the city. While staying in Florence, I also took a day trip to Rome, in which I got to see the Colosseum, some ruins, the Vatican, the Spanish Stairs, and a lot of the city for only a short amount of time. 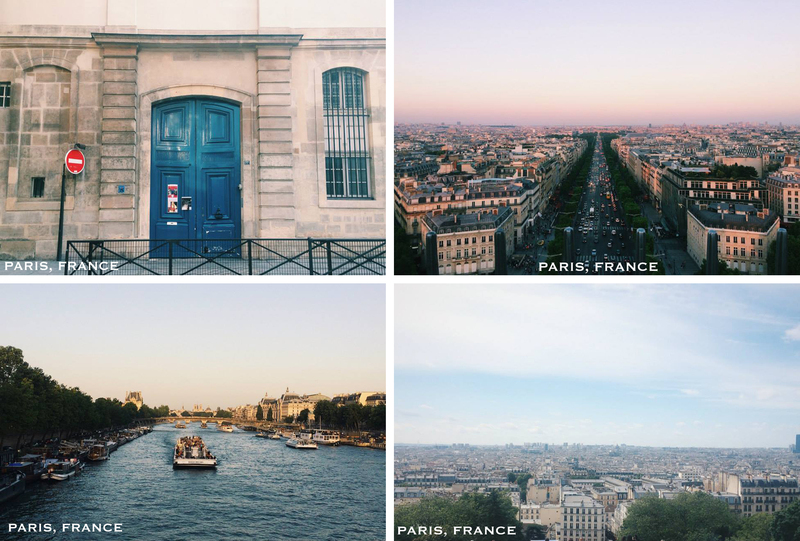 Overall, I had a really great time exploring different parts of Europe and I hope you enjoyed reading about them.